When the elements vacillate between summer and autumn, keep this ginger mint smash in mind at cocktail hour. 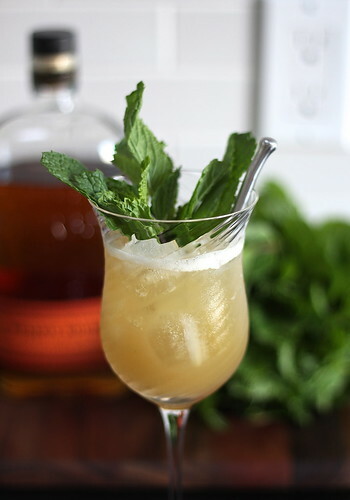 The bourbon-mint combination alludes to a perennial favorite, the mint julep, while muddled fresh ginger lends a layer of warmth to the drink, bolstering the spirit’s thawing character. I imagine it would be welcome after a day of raking leaves or picking apples, or as a reprieve from the final humid nights of the year. In a cocktail shaker or Mason jar with lid, smash/muddle ginger for about 30 seconds (we want it to release some of its juice; a ginger paste is not our goal). Add mints leaves and muddle until they’re broken down into small pieces. Add lemon juice, simple syrup, bourbon, bitters (if using) and a few cubes of ice to the shaker; cover and shake vigorously until very cold and foamy. Strain — preferably using small, fine mesh sieve or tea strainer to remove any leaves or pieces of ginger — into a glass over crushed ice. Garnish with mint and serve immediately. I can personally attest to the fact that this is delicious! Wow! Want! We need to meet up for cocktails sometime. Get out of my head — I was totally just thinking that! Excellent! I’ll holler next time I’m in the Bay Area. PLEASE DO — I’ll do the same if I’m in your ‘hood!